Woah, it’s a party up in hurr! UFC fighters Nick Diaz and Nate Diaz were spotted blazing it up in Los Angeles California! 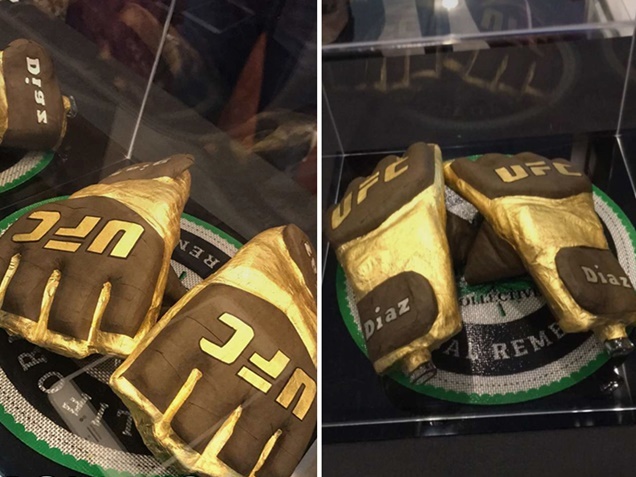 Nick Diaz and Nate Diaz took it to a whole new level Thursday night when they blazed up a custom $2,000 gold joint. The weed filled blunt was in the shape of UFC fight gloves. The UFC fighters were presented with the special bud while hanging at the California Herbal Remedies pot shop. What are the Diaz brothers thinking? We understand that Nick Diaz doesn’t have a fight on the books yet, but with this footage surfacing he probably won’t have one for a while. Nick just wrapped up his suspension a few months ago, but he’s was not thinking about UFC rules. Then, there is Nate Diaz, who just applied for a boxing license in Nevada, since he’s planning to ditch the MMA. Per Tyron Woodley, the UFC tried to hook up Nick with a match in UFC 209, but not enough money was offered, so it didn’t happen. We guess the Diaz brothers are having their best Harold and Kumar moment lighting it up. What do you think about those weed shaped UFC fight gloves? Would you smoke them?